Elaeis guineensis is a single-stemmed palm tree in the Arecaceae family that can reach up to 20 metres in height. It is native to West and Southwest Africa and thrives on open, flat land with plenty of water. The palm’s plum-sized palm fruit grow in bunches of around 1,000 and are reddish in colour. The fruit is a drupe, which means it has a fleshy outer layer surrounding a single seed. Both the flesh and seed are rich in oil, which can be extracted. 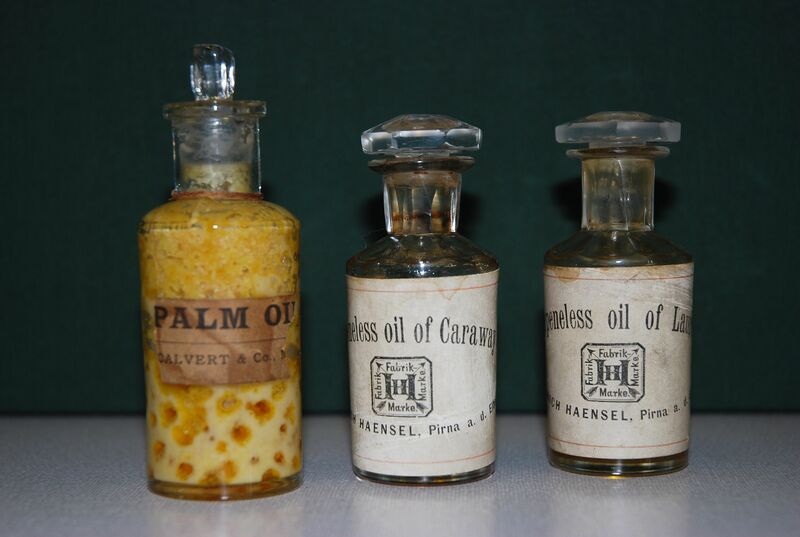 Elaeis guineensis is the primary source of palm oil and is closely related to the American species Elaeis oleifera. 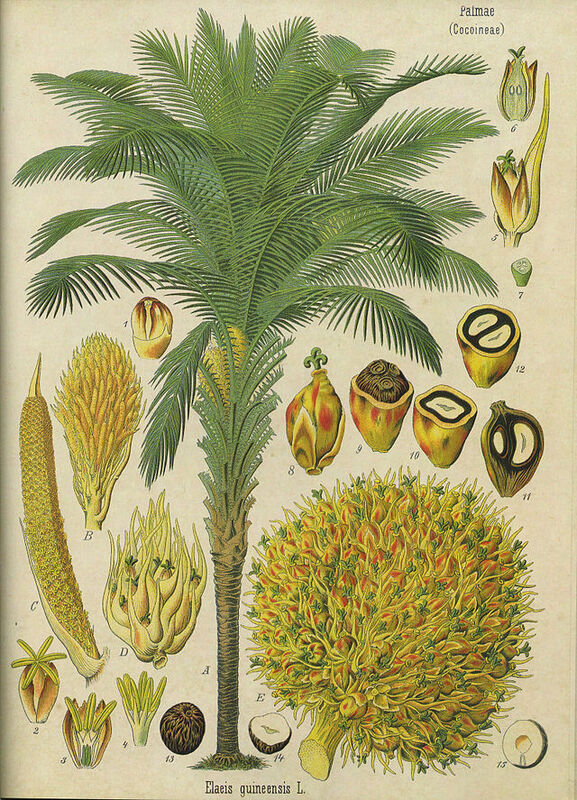 The parts of an Elaeis guineensis plant (African palm oil). In the late 1800s, archaeologists showed that humans have used Elaeis guineensis for the past 5,000 years. They found the plant in a tomb dating from 3,000 BCE in the ancient Egyptian city of Abydos. It is widely believed that Arab traders brought the palm to Egypt from Africa. Europeans were introduced the palm sometime during the 16th-17th centuries. They originally traded for palm oil in the ‘palm oil coast’ (the southern coast of Nigeria) before growing the plant in their colonies. One such colony was the British-occupied Malaysia. Elaeis guineensis became established in Malaysian plantations in the early 1900s. For the most part, these plantations were owned and run by the British until the late 1900s when the Malaysian government took control. The government set up the Federal Land Development Authority (Felda) in 1956 to operate their plantations. The main aim of Felda was to use the plantations as a means of eradicating poverty in the area. Those wishing to be involved were given 10 acres of land in which to plant oil palms or rubber plants and 20 years in which to pay off the debt for the land. In the 1960-70s, the Malaysian government expanded the project to include other crops so that they had an economic ‘cushion’ for when the price of rubber fell. Soon the land dedicated to rubber became more palm oil plantations. By the end of the 20th century, Felda had given rise to other organisations, such as the Federal Land Consolidation and Rehabilitation Authority (FELCRA) and the Sarawak Land Consolidation and Rehabilitation Authority (SALCRA). These additional organisations had the same primary aim as Felda; to eliminate poverty through the cultivation of crops. Today Felda is the world’s largest palm oil producer, with around 900,000 hectares dedicated to growing the palm. Palm oil can be extracted either from the flesh of the fruit or from the seed. As mentioned previously, some of the earliest findings of Elaeis guineensis were in Egyptian tombs. The vast quantities of oil found have suggested that they used it for culinary rather than cosmetic purposes. The unrefined oil is still a common cooking ingredient in West Africa today, but elsewhere is always refined before use. Palm oil is high in saturated fats, making it solid at room temperature and able to withstand higher temperatures compared to many other cooking oils. For these reasons, as well as a rise in popularity for naturally saturated fats, palm oil has become a cheap and popular substitute for butter. Due to its ability to withstand high temperatures, palm oil is second only to the soybean in its use as vegetable cooking oil. 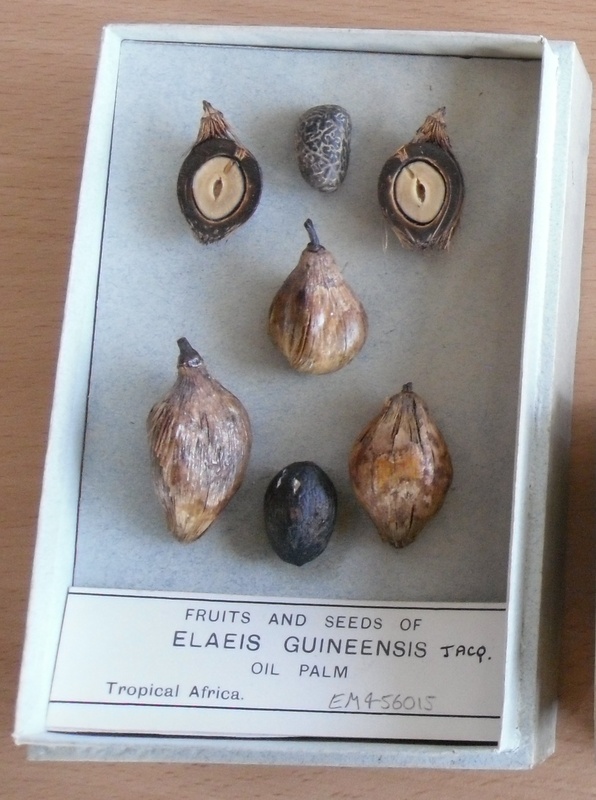 Oil from Elaeis guineensis is often also included in many other foods, such as ice cream, crisps and chocolate. Although around 90% of palm oil is used in food, its use is not limited to culinary purposes. It is also added to cosmetics, shampoos and soaps. In recent years, palm oil has become a popular biofuel. Traditional African medicine have used Elaeis guineensis as a laxative, to stimulate the production of urine, as a poison antidote, to cure gonorrhoea and to treat skin infection – to name but a few uses. However, it may not be entirely harmless as some studies have linked palm oil with cardiovascular diseases. Despite its wide range of uses, there are many social and environmental impacts of cultivating the palm. Growing the plant is a source of income for governments – particularly in Malaysia – as well as a major provider of employment. However, there have been many unfavourable social effects of this. Many palm oil plantations have appropriated lands for cultivation without consulting or compensating the local residents. In some cases, the plantations do not even employ the locals but rather import labour or illegal immigrants. 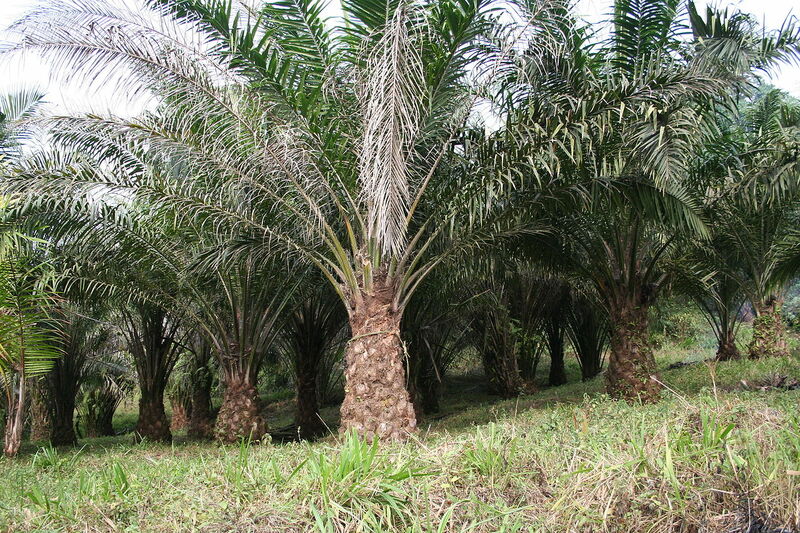 Elaeis guineensis in palm oil plantation. Along with the social concerns that accompany the plantations, there are also substantial environmental impacts. Cultivation of the plants has caused irreversible damage, including deforestation, habitat loss and increased greenhouse gas emissions. Large areas of tropical rainforests have been cleared for plantations and the resulting biodiversity loss could result in the extinction of species of potential medicinal importance. In some areas where enforcement of environmental legislations is lax, plantations have had little regulation to stop tem encroaching into protected areas and releasing pollutants into the environment. Other states have implemented environmentally-friendly practices to try to limit the damage. These have included the use of waste products as sources of ‘renewable’ methane production to generate electricity. However, palm oil plantations are still environmentally damaging as many rainforest are above peat bog that store vast amounts of carbon. The deforestation and bog draining involved in setting up the plantations releases this carbon into the atmosphere, contributing to greenhouse gas emissions and global warming. Many environmental groups have pointed out that the environmental impacts of running plantations are far more damaging to the climate than the benefits gained by the biofuel produced. 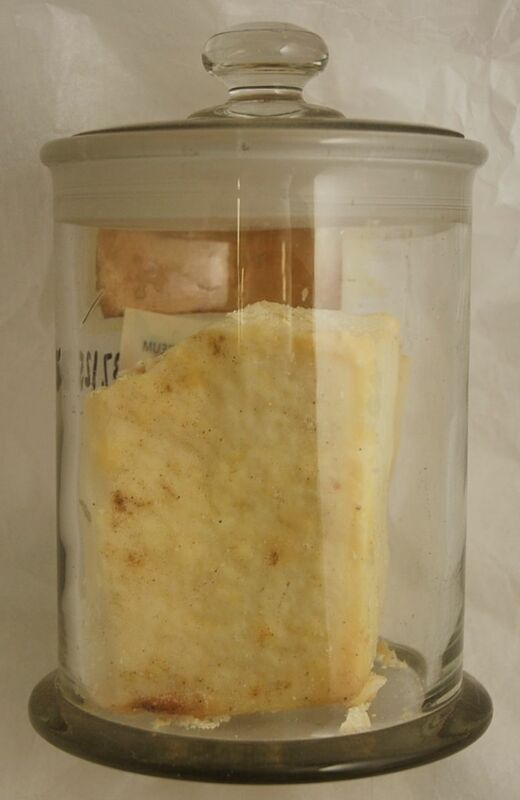 This entry was posted in Biodiversity, Materia Medica, Specimen of the Day, Students, Trees and tagged Africa, Ancient Egypt, biofuel, botany, collections, cooking, Elaeis guineensis, Federal Land Development Authority, Felda, Malaysia, materia medica, medicine, palm oil. Part 1 of this blog post (https://herbologymanchester.wordpress.com/2015/03/17/botany-in-ancient-egypt-part-1/) focused primarily on how the ancient Egyptians acquired their extensive botanical knowledge. This second blog post will now look more closely at some of the plants that they commonly used – some of which you may know! 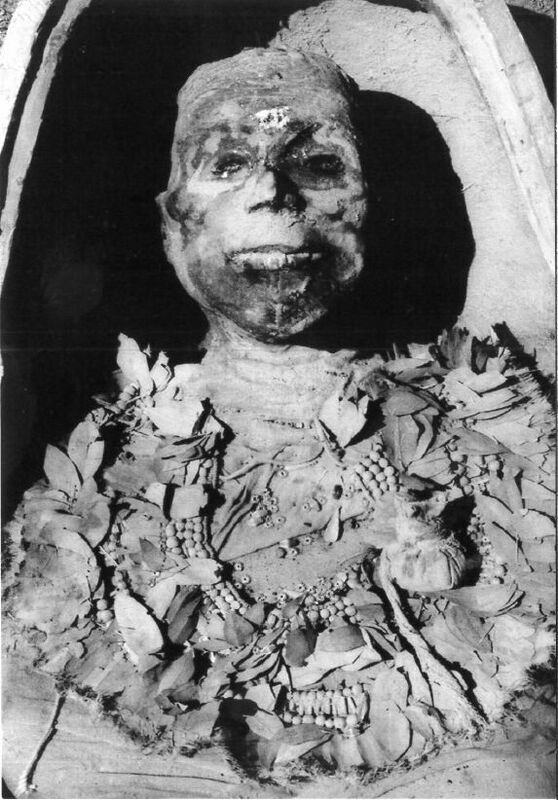 An Egyptian mummy wrapped in garlands of unidentified plants. One of the most well-known plants associated with ancient Egypt is Cyperus papyrus. The most famous use for this plant was to make an early form of paper. However, papyrus was used by the Egyptians for multiple purposes and was not limited solely to the production of paper. Other common uses of papyrus include the production of ropes, mats, baskets, sandals and chairs. The plant was also used to hold together bouquets of flowers and eaten as food. The open head of a papyrus plant was also a hieroglyph called ‘wadj’, meaning ‘green’, or ‘to be renewed’. An amulet in the form of the ‘wadj’ hieroglyph. On top of the papyrus plant, there is a falcon head, representing the god Horus or the sun-god Ra. Suspension hole at the back, for stringing. 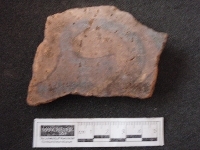 A fragment of a pottery vase that depicts a papyrus plant. Safflower (Carthamus tinctorius) is a brightly coloured flowering plant that has heads of yellow, orange or red. From these colourful flowers, different coloured dyes can be extracted. Twelfth dynasty (1991-1803 BC) Egyptian textiles used these dyes to colour fabrics a red, yellow and orange colour. The dyes were sometimes even used on mummy wrappings to give them colour. It wasn’t only the flower’s dye that was used by the ancient Egyptians. Seeds from the flower have been found in temple offerings. Safflower garlands have been found sewn onto both papyrus and cloth wrapped around the mummies. These garlands were found in the tomb of Pharaoh Tutankhamun. Oil derived from safflower seeds was also used for medicinal purposes as a means to treat insect and scorpion bites. Mummy wrappings. 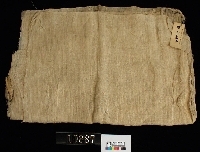 Some wrappings found have been dyed bright colours using safflower. 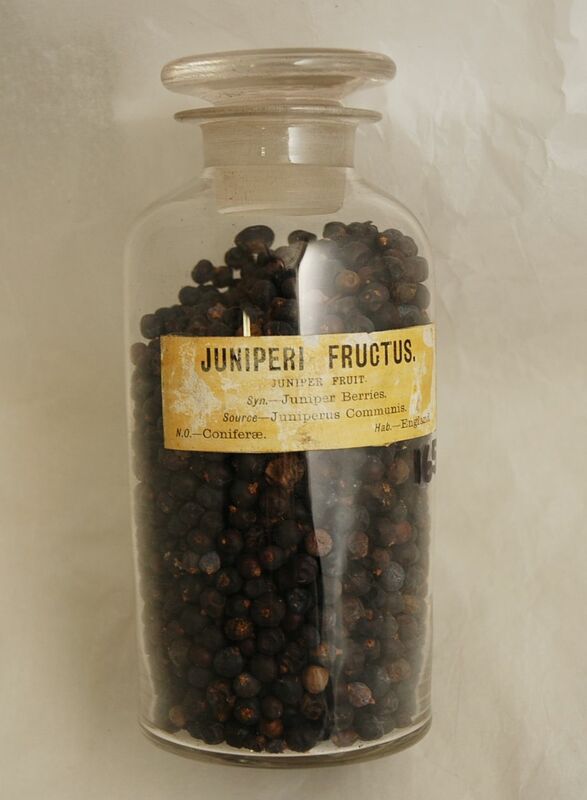 Ancient Egyptian tombs often contained baskets of juniper berries (Juniperus communis). 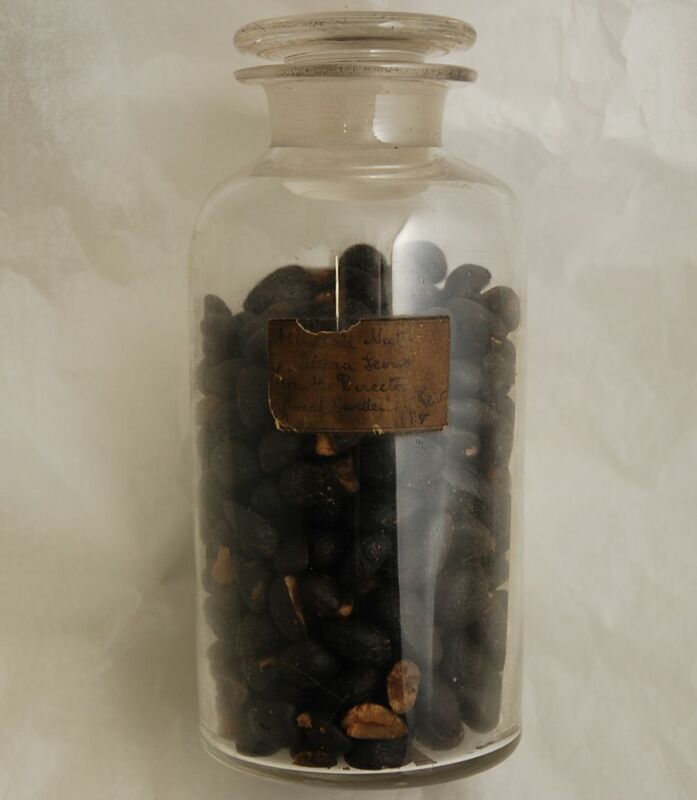 Oil from the berries was used for anointing the body during the mummification process. 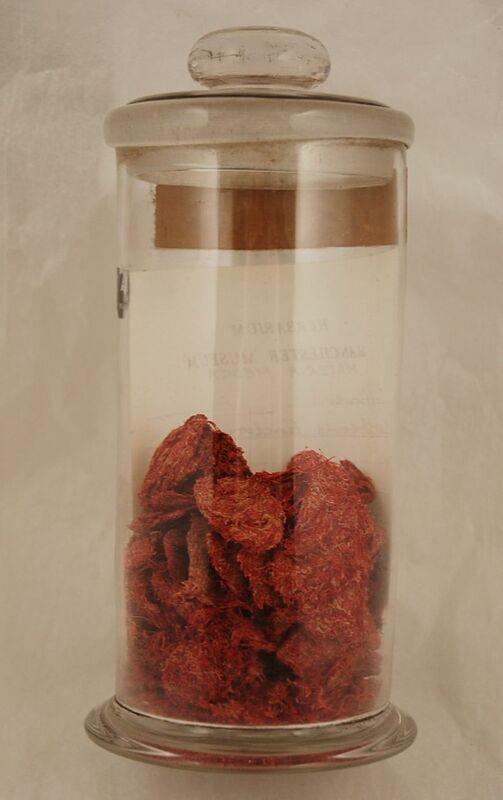 The plant was not only used with the dead as both Egyptian cosmetics and medicine sometimes contained J. communis. Juniper was employed medicinally in the treatment of headaches, asthma, indigestion and aching joints. Allium sativum, commonly called garlic, was used for both culinary and medicinal purposes by the Egyptians. It was used to treat a range of problems, including parasites, respiratory problems, poor digestion, and low energy. Garlic also featured in many dishes and it has been estimated that 1 ½ million lb (680,000 kg) to feed the slaves and workers building the pyramids at Giza. It appears that the ancient Egyptians revered the plant as images and sculptures have been found in many tombs, including that if Pharaoh Tutankhamen. 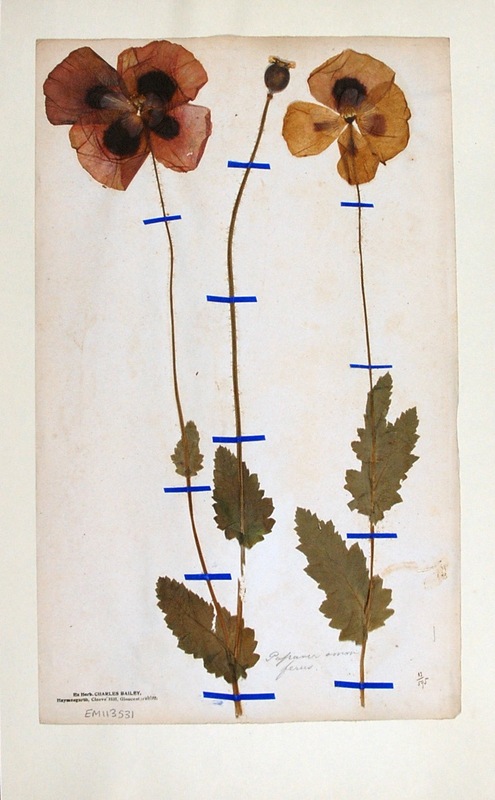 Believed to have been made by the god Thoth, Papaver somniferum (opium poppy) was used medicinally as an early form of painkiller and in cooking to add flavour to baked goods like bread. (For a more detailed history of the opium poppy check out my blog post https://herbologymanchester.wordpress.com/2015/01/23/powerful-poppies/ ). Ricinus communis (castor oil plant) was used extensively by the Egyptians; being employed as lamp oil, anointing oil and in medicine. 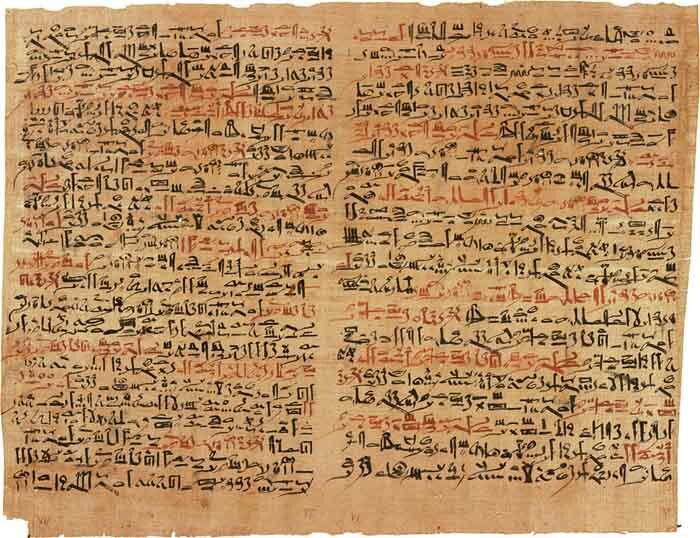 The Ebers Papyrus, a medicinal text from ancient Egypt, has a whole section dedicated to the plant and its derivatives (particularly the oil). Castor oil extracted from the seeds was said to cure stomach illnesses, constipation, skin diseases, head-lice and hair restorer. They also believed that the oil was an effective treatment for treating diseases caused by demons. 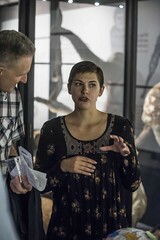 I hope you have enjoyed this post and a huge thank you Campbell Price (the museum’s Curator of Egypt and Sudan) for all your help with this post! 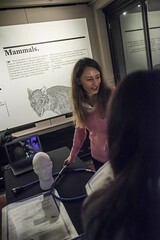 Check out Campbell’s Egypt blog at https://egyptmanchester.wordpress.com/ for more fascinating posts about ancient Egypt! This entry was posted in Materia Medica, Students, Uncategorized and tagged Allium sativum, Ancient Egypt, botany, Carthamus tinctorius, Cyperus papyrus, Egyptian mummy, Garlic, Juniper, Juniperus communis, materia medica, Papaver somniferum, Papyrus, poppy, Ricinus communis, Safflower. 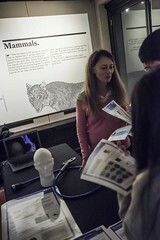 During my research into the Materia Medica collection (plant, animal and mineral based medicines used in from the 1800s) at the Manchester Museum, I have notice a recurring feature; many of the plants had in fact been used by humans for thousands of years and a large portion of these by the ancient Egyptians! Plants featured heavily in Egyptian culture: in food, medicine, religion, perfumes and beyond. Early medicinal texts, such as the Ebers Papyrus from 1550 BCE, provide detailed insight into their extensive herbal knowledge. Unfortunately no complete record has yet to be found, but the fragments that have survived show just how knowledgeable these ancient peoples were when it came to plants and their uses. Many of the applications documented are the same used right up until the introduction of modern medicinal practices. Even today, large portions of herbal remedies used as ‘alternative’ medicines feature plants used for similar purposes as those used by the ancient Egyptians. Not all of the plants known to and used by the Egyptians were native to their homeland. 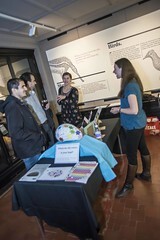 Their extensive knowledge on the topic can partly be attributed to trade. 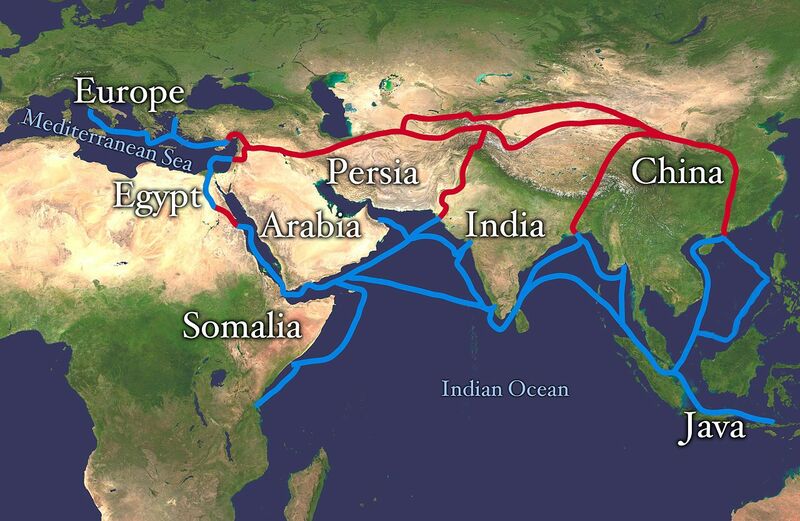 Caravan and water routes connected Egypt to trade routes around the world, allowing the exchange of tradable items like spices and fabrics. Silk traded from China has been found on Egyptian mummies dating from around 1000 BCE. 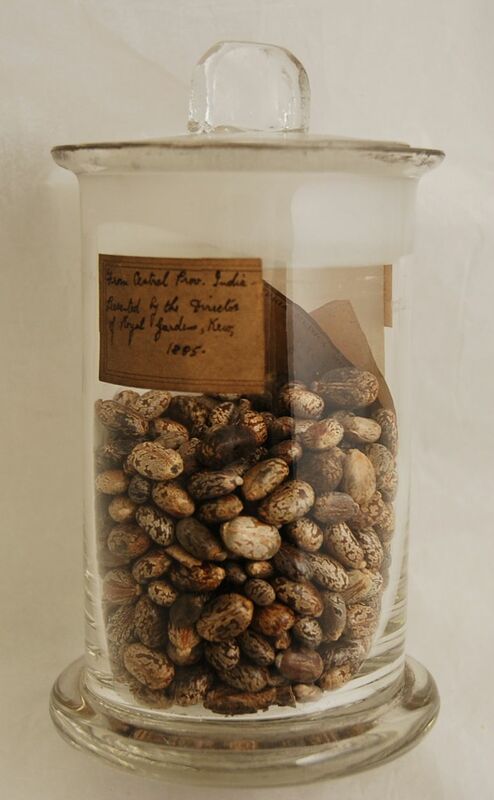 As well as the benefit of trade, this connection to the rest of the world also made it possible for botanical knowledge to spread to Egypt from distant countries like China and India. 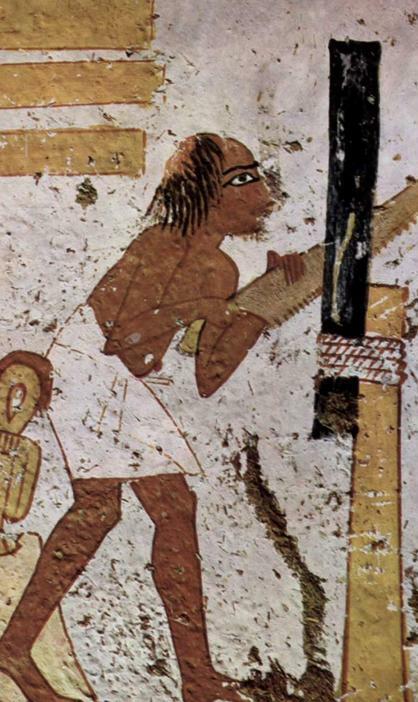 Another notable factor that played a role in the vast accumulation of plant knowledge was that the Pharaoh’s actively sent out plant exploration parties. These parties, such as those sent by Queen Hatshepsut around 1500 BCE and by Pharaoh Sankhere in 2500 BCE, were sent to discover more plant resources that could be exploited. There is one particular Pharaoh that is worth mentioning in regard to the mass accumulation of botanical knowledge in Egypt: Thutmose III. He was an 18th dynasty Pharaoh who reigned between 1479–1425 BCE (part of which was as co-regent with Queen Hatshepsut). During his rule, Thutmose led numerous military expeditions, from which many foreign plants and animals were brought to Egypt. 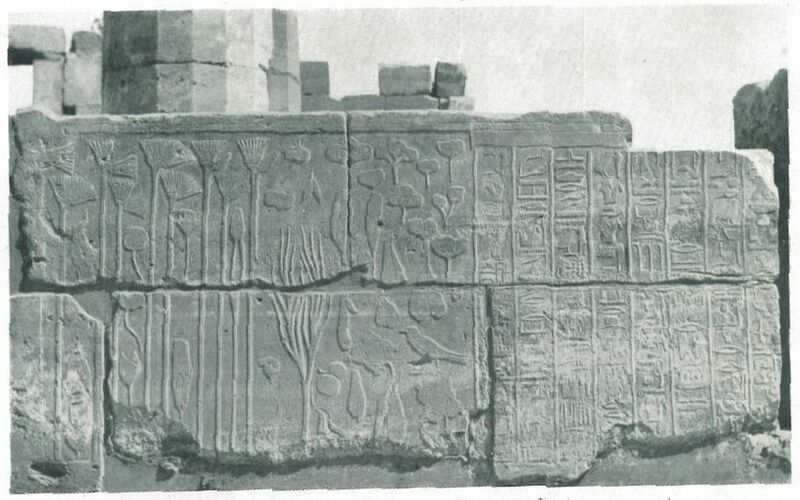 It was during his reign that the ‘Botanical Garden’ was erected in the temple of Akh-menu at Karnak. 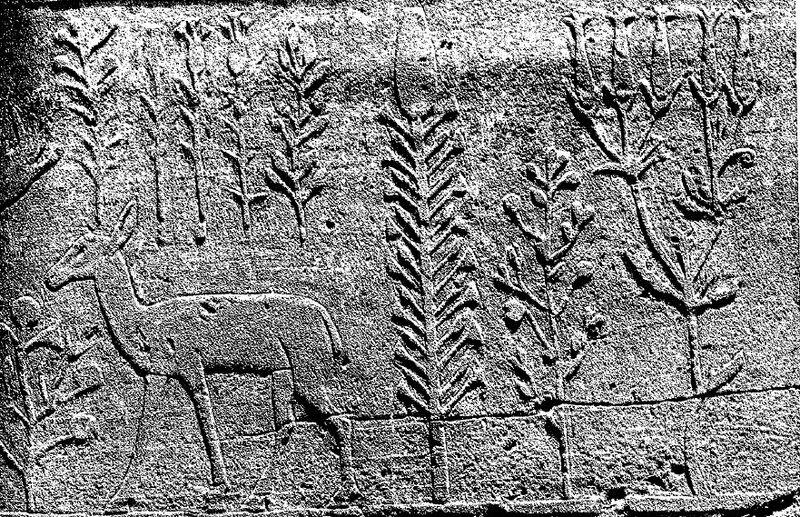 This ‘garden’ is a chamber whose walls depict carved representations of the plants and animals collected by Thutmose. Because of its physical isolation from the rest of the temple, the ‘Botanical Garden’ of Akh-menu is a particularly sacred chamber and believed to be the place in which the priests of the god Amun were initiated. This entry was posted in Materia Medica, Students, Uncategorized and tagged Ancient Egypt, botany, Ebers Papyrus, Egypt, history, materia medica, Queen Hatshepsut, the ancient Egyptians, Thutmose III, trade. In conjunction with our ‘Collecting Trees’ project and as part of our ‘Discover Archaeology’ Big Saturday on February the 9th, the Museum is delighted to host Dr. Geoffrey Killen, an expert on ancient Egyptian woodworking, who will demonstrate ancient craft techniques – LIVE! Watch Geoff use replica ancient Egyptian tools to make furniture, the Egyptian way. 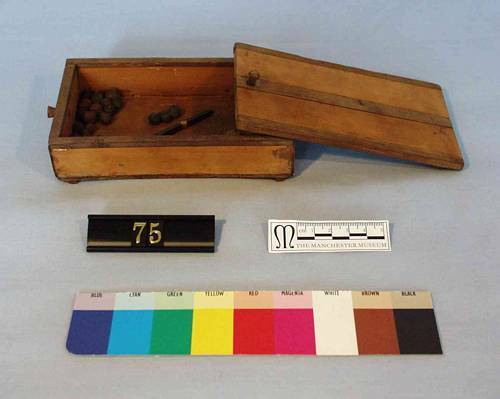 There will also be a chance to see Egyptian wooden items normally kept in storage. 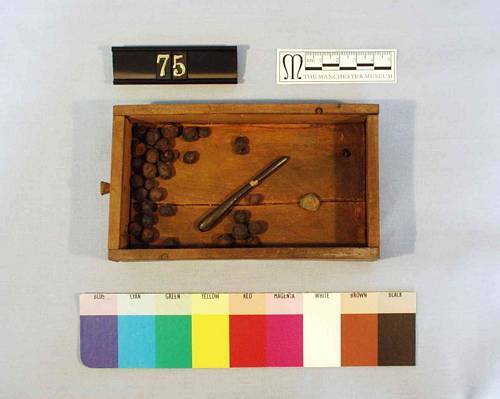 This entry was posted in Manchester, News, Trees, Uncategorized and tagged Ancient Egypt, lathe, Trees, Woodwork.